The Old State House was the seat of British Government before the Revolution and afterwards served as the Commonwealth’s first capitol building, with the office of the state’s first governor, John Hancock. Located at the crossroads of the city’s two main streets, the Townhouse, as it was then called, was the center of Boston’s civic, commercial, and political life. The distinctive cupola was once the tallest point in town, and the building’s façade was topped by the lion and unicorn, symbols of royal authority that were torn down and burned after the Declaration of Independence was read to the people of Boston from the building’s balcony in 1776. Some of the most significant events leading up to the Revolution took place inside and around this handsome Georgian structure, and many of the basic concepts underlying American government were first voiced within its walls. In its Assembly Hall, Samuel Adams urged resistance to taxation imposed without representation. In its Council Chamber a defiant James Otis railed against unwarranted search and seizure, in a speech that later prompted John Adams to declare that Then and there the child independence was born. Outside its doors the Boston Massacre unfolded in 1770, resulting in the deaths of five men, and galvanizing public opposition to British authority. 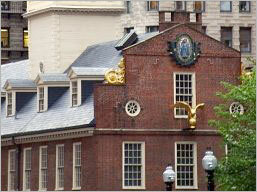 The Old State House is today maintained as an historic site and museum by the Bostonian Society. 지금은 박물관으로 쓰이는 구 주의사당은 1658년에 완공되었던 구 집회소가 소실되자 1713년 그 장소에 주의사당을 지었는데 보스턴에서 가장 오래된 건물인데 1766년에는 회의장으로서는 처음으로 회랑이 생기고 일반 시민을 위한 방청실도 마련되었는데 그때로서는 아주 획기적인 일이었다고 압니다. 독립전쟁이 일어날 때까지 사용되었으며 건물의 1무역, 2층은 식민지 정부의 회의실과 지방재판소로 사용했습니다. 보스턴 주민들에게 처음으로 독립선언서를 낭독했던 곳으로, 수많은 미국의 독립 지사들이 영국에 대한 자유와 독립을 소리 높여 외치던 역사적으로 뜻 깊은 장소이기도 한 이곳은 지금도 매년 독립기념일에는 이곳에서 독립선언문이 낭독되고 있습니다. 그 후로 여러 번 건물의 용도가 바뀌다 박물관으로 자리잡았는데 1층에서는 구 주청사 건물의 역사에 관한 비디오 상영과 선박 박물관이 있으며 설명회도 준비되어 있고 2층은 보스터니언 협회 전시실로 옛 보스턴의 ㅁ습을 담은 사진을 전시합니다. 고층 빌딩 사이에서 기묘한 대조를 이루며 서 있는 붉은 벽돌의 건물을 찾으면 됩니다.